Similar to mites, bird lice are one of the most common parasites found on birds. Often an infestation is not highly visible until the bird is in severe discomfort. Still, some birds show no visible signs of infestation. There are different species of lice--and certain lice only attach to certain species of birds. Some lice will bury themselves into the skin of a bird, and live off of the host's blood, while other forms of lice will feed on feathers and dead skin. Once removed from the host, the lice can not live longer than a few days. Monitor birds for restlessness, increased pruning, and agitation. These are signs that there could be a lice infestation. Because lice are extremely hard to see, use a magnifying glass and visibly inspect the bird. Look for elongated, dark brown insects on the bird's feathers. The lice will be about 3 mm long when fully grown and do not have wings. Remove all material used for nesting from the bird's cage. Thoroughly clean the bird cage and toys with a bleach-and-water solution if a visit to the vet is not immediately possible. Boil toys and perches in water and allow to air-dry prior to placing back in the cage. The vet may prescribe or recommend a strong cleaning solution. Clean the surrounding cage area, as lice may be on a nearby table top or window sill. Disinfect all areas to avoid reinfestation. Treat the bird with the proper insecticide approved by the vet. Always check with a vet to ensure treatment is safe, as the substances used to kill lice are highly toxic. Common treatment includes use of dusting powder and sprays on the bird and cage. Avoid contact of insecticide with the bird's eyes and any mucous areas. 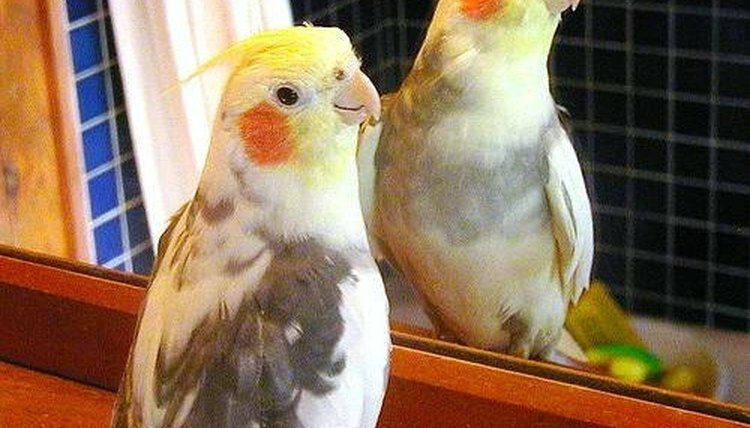 Misuse of lice control treatments can cause your bird severe pain and even death. Observe your bird for signs of lice returning. Though the common symptoms include restlessness and plucking of feathers some birds do not show any signs of lice infestation, yet they may still be in pain. Schedule a checkup with an aviary vet to ensure that the condition has been effectively treated and resolved.